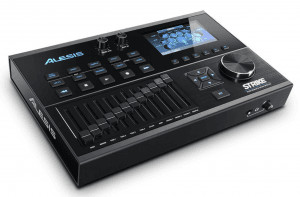 Alesis Strike Pro Review 2019: Is It Worth the Cost? 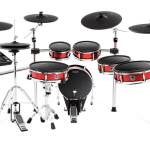 Electronic drum kits have waxed and waned in popularity over the years. Some drummers wonder whether they are worth the money or not. Especially so when it comes to brands beyond the firmly established electronic music giant Roland. I guess it’s because of this sentiment that Alesis has put a lot of work into the Strike Pro. Their aim was to create a truly professional electronic kit that is able to perform as well as top of the line acoustic kits. What we are looking to find out is: have they achieved that goal? This Alesis Strike Pro review is going to answer that question. When you unbox the Alesis Strike Pro, the first thing you will notice is the size of the thing. This is not a small kit! So the only thing not included are the pedal for the kick drum as well as the Hi-Hat stand and you’d have to buy them separately or use your existing gear (which should be fully compatible). Note: This is what you’ll get in the box with the “Eleven-Piece Strike Kit“. If you opt for the – less pricey – eight piece kit – you WON’T get the 14” drum pad and one 14” dual-zone crash instead of three. To my mind, this is up to your particular setup taste. In terms of quality, this doesn’t make a difference to the kit and all my following remarks will apply to both versions of the Strike Pro. The heads are large and authentic-looking. They are designed to be like real drum heads in terms of surface area, and are also intended to mimic the feel of acoustic drums. The cymbals are not full-size (they are crescent-shaped rather than circle-shaped), but their surface area is impressive nonetheless. The kick drum is sizable, and gives some good resistance to the kick pedal. This is maybe the greatest strength of this kit — the way it responds to being hit. Because of its size and weight (and the makeup of the drum heads) these things really look, feel, and sound like the real thing. The Strike performance module has some awesome features.This module sports a 4.3 inch color LED screen, which all by itself may be worth the cost. Images are clear and vibrant, and while this feature may not make you play better, it just might make you more likely to play more. I mean, who doesn’t love great tech, right? The module has on-board sampling capabilities, which means that the module itself can sample audio. In addition, its USB/MIDI connectivity and SD card storage ability are designed with professional audio production software in mind, opening a whole world of audio processing and MIDI manipulation. This may not appeal to every drummer, but it could change the whole game for some of us. Modules may not make the drummer, but they do in some aspects, make the machine; and this because of this module, this (drum) machine is top notch. The Alesis Strike Pro module houses a library of sounds that is impressive in both scope and depth, to put it mildly. 110 distinct (and newly designed) kits have been assembled from 1600 instruments, each multi-sampled (meaning that more than one sample was taken of each instrument to ensure accuracy and completeness). But it doesn’t matter how many sounds there are if they don’t sound good, and by that measure, the Strike Pro comes out with a home run once again. This is what you get when you go Pro: unparalleled sound quality. More than any other feature, this is the one that drives the price of the unit up (in my opinion this is the one that makes the unit worth that price). Do I think it matters if you spend the extra money and get a top of the line piece of equipment? Well, it may not make you play like Mike Portnoy, but it will make you sound more professional right out of the box. And if that makes you play more, makes you practice more, makes you perform more, then it’s hard to put a price on that. 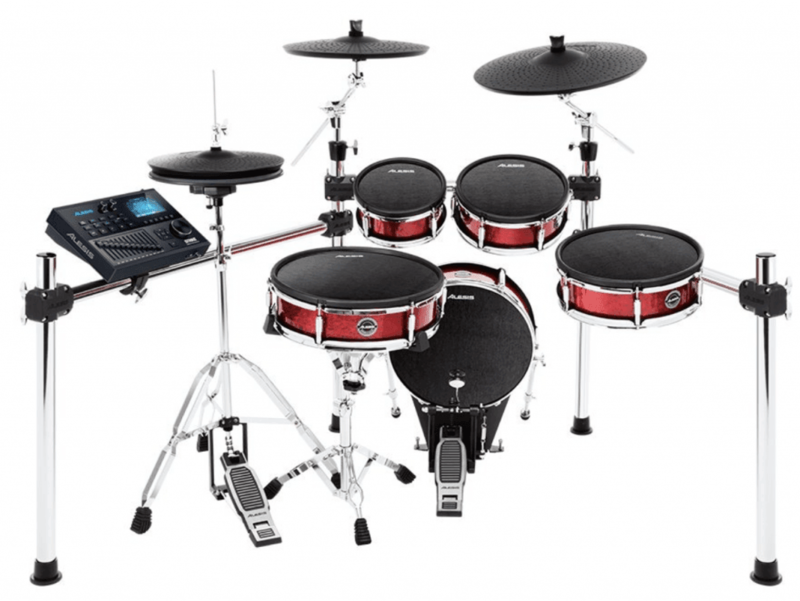 This is what so many players ask me about electronic drum kits: How does it feel? Even if we know that we will be hitting electronic pads, what we really care about is how close those pads come to feeling like the real deal. It may not (yet) be possible to copy exactly the way a real drum feels, but the best kits come very close. Good electronic kits succeed at not only delivering great midi ability (which adds impressive flexibility to the instrument) but also in replicating the sounds and feel of real-life drum kits (which is what drove me, and probably you, to play electronic drums in the first place). The Alesis Strike Pro is one of those kits. The first thing to notice is the size of the drum pads on this thing. They are real-life, full-size pads, with all of the room of real drum heads. 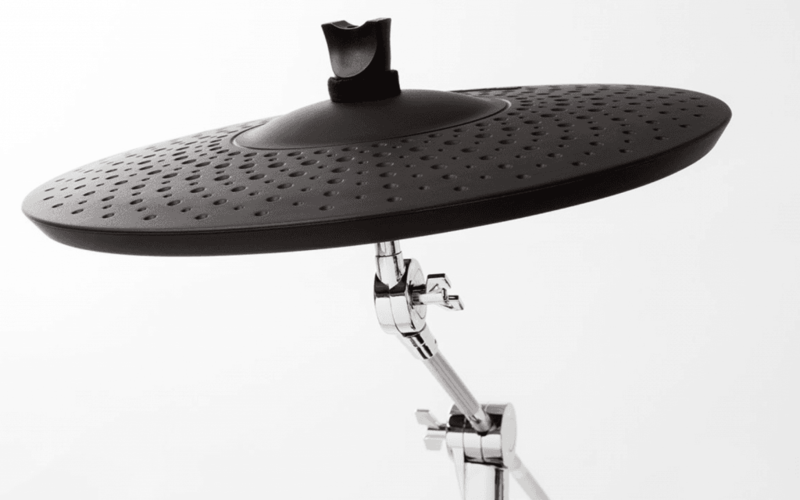 The cymbals offer a bell area that is larger than most, in order to help you get a range of feels and sounds out of them (just like the real thing). Beyond the impressive size of these drums are their responsiveness. They react and feel almost exactly the way real drum heads do. You don’t have to sacrifice much in the way of feel with these guys, and you even gain a whole lot in other areas. Overall, these things feel great. If you want something that is 100 percent exactly like an acoustic kit, then maybe you should buy an acoustic kit; but if you want a close approximation to those kits, with a whole lot of functional bells and whistles, then the Strike Pro is a great option, even at its price. How good is the Strike Pro? When I play a kit, I don’t just want it to be good, I want it to be fully professional. And for the price of this kit, that’s what I expected. The question is – with all its bells and whistles, what are its real pros? Well, the first two huge things that the Alesis Strike Pro has going for it are its feel and sound quality. Both of these things are subjective, and not all players will agree with me, but when I play this thing, the feel and sound impresses me to no end. In the video above, notice how responsive the drums seem to be to his strikes. And notice how nuanced the sounds of the kit are. The people at Alesis have really gone out of their way to put together some great sample libraries. When you hit one of these drum heads, it isn’t like hitting one of those old-school electronic drums (where the stick never seemed to bounce back the way it was supposed to). Here, it is as though you are hitting a real snare, a real tom – just as well as you seem to be kicking a real kick drum. Also, there’s the very solid chrome rack which doesn’t even flinch even if I pull out my hardest rock moves and songs. With other kits this can be an issue, but Alesis seems to have done a good job with the chrome frame here. Finally – and I’ve already touched on that point right now – there’s no other flagship drum kit out there that comes even close to the Strike in terms of its price. As you might have understood by now: I really, really, really like this kit. That being said, there’s one issue with it and I’m not going to hid it from you. The Hi-Hat used to not work properly when doing lots of opening and closing action with it. You can read all about it in the thread that I’m going to link to in a second. But before that one freaks you out, you should now: there has been a firmware update about a week ago, and this seems ot have fixed the issue entirely. But just so you can see for yourself, read here. Is this product ready to use out of the box? Yes and No. It comes with everything you need to use the kit, as long as you don’t need to use the pedals (and provided that you have an amp). It does not come with any pedals or amplification. Pedals are sold by Alesis separately and you need to provide your own amp. How do you amplify this kit? The kit will need a PA or keyboard amp to run through. Does it come with pedals? No, it doesn’t come with hi-hat or kick drum pedals. These are sold separately. First, there are other Alesis products. These are generally cheaper than the Strike Pro, but they are great nonetheless. These include the Alesis Strike and the Alesis DM10X kits. Both of these kits are solid, and neither of them will hurt your pocket as much as the Pro. Second, there are similar products by other brands. If you want to check out a comparable one here, you might want to check out the Roland TD-11K – it’s even slightly less expensive than the Strike Pro. If you want to go super-high quality (and a bit more expensive) see the Roland TD-30K. Overall, the Alesis Strike Pro is an extremely high quality kit. I would absolutely recommend it, to electronic kit enthusiasts as well as acoustic players, if they can afford it. In every case in which I had the money to buy this kit, I would do so. It’s that good. There’s just really nothing wrong with it, and it has so many great features and feels and sounds so good that it’s a hard instrument to pass up. So there you have my Alesis Strike Pro review. Do you have a similar opinion on this kit? Do you disagree? Feel free to share your questions, comments, experiences, and criticisms below. I have only one question concerning the sound of the cymbals. A lot of electronic cymbal sounds stop abruptly rather than fade down to nothing. How would you rate this on the alisis kits? The great thing about the Alesis Strike is that it comes with a module that allows you to fully csutomize every nuance of your sound: including the reverb of the cymbals. You can see how to edit the reverb step by step on page 13 of the manual. I bought the kit. It came today. I was amazed.. I weight of it is unbelievable. This kit is no joke. Heavy duty all the way around. It took 2 hours to set it up. Impressive looking. Couldn’t believe the sound. I went through every kit. I had to hear them all. The heads felt great. I’m not making any adjustments until I play it more. May not need too. I think Alesis out did them selves on this one. Thanks for sharing your impression. I agree with you, Alesis did a fine job on the Strike in my opinion. Cheers and lots of fun with it! Electronic drum cymbals always sound better with the decay raised up high. This itself gives the cymbal pads a long realistic sound like metal cymbals would give. The larger the metal cymbal, the longer the decay when you crash on it. Awesome, thanks so much for helping out here, Leib! Thank you so much. I’ll definitely make the adjustments. Happy to hear that, Dan! Actually I think it’s a steal price wise when you compare it to the Rolands. Plus it uses samples and you can sample your own drums. To me it’s a no brainer. I’ll be ordering one soon! I couldn’t agree more, James. I’m sure you won’t be disappointed! I think durability is something you can’t generalize easily and that you – alas – have to test out for yourself. For that reason, I recommend you get a kit yourself and test it out. To be on the safe side, you can always buy an insurance for little money along with the kit. Sorry I can’t give you a definitive answer here. But I have gone down the same route with all my Alesis kits an not faced any issues yet. However, no one on these threads seem to mention 2Box Drummit 5 as an option. Very similar to the Alesis in terms of function, similar hardware setup. And it’s an open system. In fact, it seems Alesis looked at what 2Box was doing and copied it. I’ve had a Drummit 5 in the past when I wasn’t in a live band and was amazed at the sound quality and responsiveness and utter lack of machine gunning. They sounded better that Roland’s best flagship kit. Similar price point to the Alesis Strike pro too. But the Strike Pro looks well worth the money. Thanks for pointing that out! I too have heard good things about the Drummit5. I haven’t tried it out yet, though – but I’ll put up a review of it as soon as I can. In the meantime, like you say, the price point is similar to the Strike Pro and at least in terms of appearance, the Strike Pro looks a good bit more professional to me. Ya, the Strike Pro seems better built and looks better than the 2Box orange. The sound quality of the 2Box is unmatched IMO. The feel is very good too. Single ply mesh heads over different size pads. No fx tho which was always a downside. They may have updated that by now. Now I really want to check the 2Box out! Thanks, Evan! I’m a guitar player/song writer/producer/engineer that can play a little drums but mainly I will program the drums. Have done so since the Roland MC 500 and the Alesis HR-16 Drum Machine. I want to use the kit to write with and when I have drummers come into my home studio I want them to play the kit. I really want 8 outputs and that is what is amazing about this kit. The Strike Zone for $1699 is way less than others with 8 outputs. Do you know of any other kits with 8 outs that would work in this price range? The Strike Pro would indeed be the cheapest option I know of with 8 outputs. There’s also the Roland TD-20K that has 8 slots, but it comes at a slightly higher price – and then there’s the 2box Drumit Five which is quite a bite more expensive (and looks a lot less professional – I haven’t tested it yet though). In terms of quality, I think both the Alesis as well as the Roland are great value for their money – but I’d give the Alesis the edge, because it’s newer and has a better feel to it (for me). Hey Yannik, thanks for the review. Do you happen to know if the Strike Pro kit’s bass drum head can accommodate a double pedal setup properly? Hi Yannick, thanks for this thorough review. I am wondering about the sound levels of the unamplified Strike Pro kit. How loud is it? This is very important for the apartment drummers whose neighbours don’t hold double bass and blast beats in high regard. Without amplification, hitting the Strike Pro would be approximately as loud as hitting a strudy cushion with a stick. That’s because the Strike has mesh heads. Rubber pads would be a bit louder. Please also see my buying guide in this article (last third of the article). Do you know if the Roland 18″ CY-18DR digital ride trigger is compatible with the Alesis module? If you exchange it for the 3-zone ride that already comes with the Strike Pro that should work (although I haven’t tried it and can’t guarrantee. But I don’t see a reason why it shouldn’t). May I ask, though: why don’t you like the 3-zone ride that comes with the Strike in the first place? Thanks for the reply. I am just looking into it. I may buy a used Alesis SPK and just anticipate that the ride would feel small. Maybe not, I check the kit out tomorrow. I know you “get what you pay for” but in my current situation the playing space is small and it’s noisy to say the least. This might serve us well for recording and collateral noise. I see, makes sense! Happy checking then! No. The new Roland digital ride or digital snare with positional sensing are not compatible with any module other than the td50. They use USB instead of the 1/4 inch cables were used to. Thanks for telling me! That’s good to know! Still, you could go for the 15” 3-zone ride – but your issue was the small size, right? I loved your review. Very thorough. I’m currently looking for a new electronic kit and I like the Strike Pro kit, but I see so many bad reviews about the Hi-Hat. Just not sure what to do. I’m also looking at the Yamaha DTX760 and Roland TD50K. What do you think? I think the Alesis is, by far, your best bet in terms of price-performance ratio. It’s true, there were quite some HiHat problems with the Strike, but a firmware update has been made available about 2 weeks ago and that seems to have solved the issue. Still, because this is a higher-priced kit, here’s the link for you to read the whole thread. The first part is quite off-putting, but as you’ll see for example in “isaac rader’s” post towards the bottom, the HiHat works now. This helped out a lot!! Thank you for replying. You’re right. There was an update and finally they fixed the problem. It is a really nice kit! Thank you again for your help. Got another question. Where’s a good place to buy it from? I heard a lot of good things about Sweetwater. Is Sweetwater good? What would you do? Guitar Center? I always buy at Amazon, since I’ve made used of their guarantee (you can even return if you simply don’t like the product) several times and this has always worked without problems. I heard good things about Sweetwater too, but haven’t bought from them so far. Thanks for the thorough and interesting review! It answered a lot of questions for me, because I used electronic drums only once, and that was in a music store for ten minutes. And now I’m in the process of deciding which drum set to buy. The answer to my question may be obvious, but . . . better to be sure: Obviously, an amplifier is needed to hear the set without using headphones. But when using headphones, do you simply plug its cord into the brain and then you can then hear them fine? Or is an added amplifier of sorts needed? No you don’t need any sort of additional amplification. You just plug the headphones into the drum module / brain and it works just as well as you had plugged them into your phone. Thank you, Yannick, for the information and your expert opinions. It’s much appreciated. Actually, I’m still having trouble deciding, currently between Roland TD-25 and the Alesis Strike Pro. The size of Roland’s toms are practically stupid (8″! ), and the set seems artificially high-priced. And the Alesis, as described, has a malfunctioning hi-high hat. I went through many of the owners’ posts, and it just sounds so bad. Maybe the problem is fixed, but I would need reassurance from Alesis before purchasing. Thank you, David. I’m with you on the TD-25 – although as you see the price seems to preculde (initial) problems like the one with the Strike hihat. That said, there has been a firmware uüdate for the Strike about a month ago, which fixed the issue for many owners. Some are still having issued, but different ones than before and I don’t know if this is due to incorrect configuration or still an issue caused by the hardware-software interplay. You can read the whole discussion for yourself here. Have you noticed any cross-talk between different components when playing the SP kit? I’ve played a few other kits and getting cross-talk between some toms and cymbals for example. Do you mean you noticed cross-talk when playing other kits? Or when playing the Strike Pro? Generally, cross-talk is most often the result of a misconfigured module and a few tweaks of the settings can remedy the issue. But please let me know what exactly the issue was and which kit you’re referring to – and I’ll gladly try to point you into the right direction. Hello Yannick. I wasn’t specifically speaking of the strike pro kit when i mentioned Cross talk. I have noticed on other kits. Sometimes when you hit of center on a Tom you will hear the crash cymbal. I was wondering if you come across this issue on three strike pro kit? Personally, no I’ve experienced no cross-talk on the Strike Pro. There has been a HiHat sensitivity issue though. It has meanwhile been fixed through a hardware update, but if you want to check this out yourself, see this comment. HI yannick from Greece, I ordered the strike pro today, I was using the roland td-10,( still working without any problems) do you know if it’s possible to add more cymbals in the module? I’m using superior drummer 3 and I want to add more pads, thanks for your excellent review man.. Thanks for reaching out and cool you ordered the Strike Pro! As for expansion: the module does have 4 additional ports for tom pads. Would you mind letting me know how you’re finding the kit once you’ve played it for a bit? Thanks for your question – the phrasing of which made me smile! Unfortunately, the Alesis Strike does not support brushes. The Roland TD-30 does, but you’ll have to use nylon instead of wire brushes. And yes, I still do enjoy the Strike (not being a much of a brush user). The design and sound still blows me away, and I still like I made a bargain (at the normal price). I was wondering if you can use a guitar amplifier with the kit for sound? I was also wondering approximately how much room the kit takes up (e.g. width x length)? Unfortunately a guitar amp won’t be able to amplify the bass frequencies of the e-kit, so I wouldn’t recommend it. Keyboard or dedicated e-drum amps will both do the job and you can find my favorites here. The size of the Alesis Strike Pro when assembled is about 52″ x 34″ x 35″ (width x depth x height). I have an Alesis DM10X, which I have exchanged the front bars to longer bars to set up a 3 tom / floor tom configuration. Is the rack a standard 1.5 inch chrome? Also I have made a trigger out of a cowbell and currently use it with my Sample Pad Pro for audio samples, is there any extra inputs for more cymbals, pads, or triggers? Thanks for your question. Yes, the chrome rack is a 1.5 inch one. And the Alesis DM10X module will have one empty trigger input once you’ve connected all the cables to use as you please. Hey Yannick, I was wondering wether this kit allows Drummer’s to do play along songs through head phones? It sure can. In fact, any electronic drum set does that. You just have to plug in your smartphone or music device via the 1.4″ input – and you can play-along / listen to it either via headphones or through an external speaker. Where would you put the Alesis Strike Pro if you were to compare it to the Roland models, both current and historical models? I ask because I am considering which set to buy. There are a few used Rolands for sale. I am also wondering which is best of the old TD-20KV, and the newer TD-25KV. Except with TD-30KV the price is not an issue. As I understand nothing else is near 30/50KV. But what would be the closest? Have to say, the Strike Pro looks great, but Roland seems safer to buy. Short about me, I have now a TD-6 and a Tama Starclassic. Selling both to buy a newer electric set. I play most of the time at home, with the occasional gig at parties. I am prepared to spend 2-3000 on my next set, new or used. Thanks for your question. Just like you suggested I think the Roland TD-25K is the Strike’s closest competitor. I’ve been planning to review the TD-25K for quite some time, but can’t really promise when this plan will be carried out. Do you want me to let you know once this happens? On a premature note: I think the Alesis is the more professionally-looking set (which is a big factor once you’re taking it up on stage) and both kits are fairly equal in terms of their sound quality (which is, of course, a very subjective judgement). The Roland is slightly further ahead in terms of quality control I think. In other words: the Strike Hihat needs some tweaking for some people initially. Do you know anywhere in Portugal or England. Sunderland preferably. Where I can try one of these things out. Unfortunately I’m not familiar around Sunderland, so I wouldn’t be able to recommend a drum store. One other thing. Can you do cross stick on the snare. You certainly can, but you wouldn’t actually cross the stick as this can confuse the dual triggers (of any drum set, non just the Alesis Strike). Instead, you’d just hit the rim directly and produce the desired sound that way. Hey Yannick, that was a nice article and clarified some of my doubts. One thing I’m still wondering is that are the kick and snare pads sensitive enough to pick around 300bpm (hyperblast beats)? There are many kits which don’t read such speedy strikes. Also, which pedals will be the most suitable for this kit? 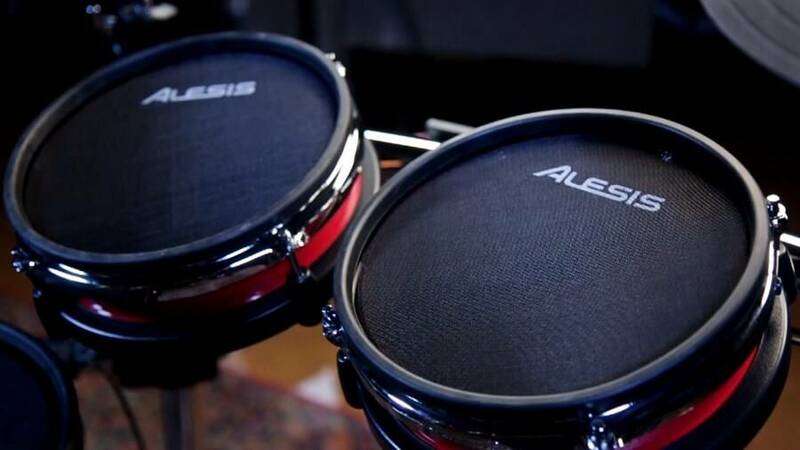 I don’t play blast beats, but this video suggests the Alesis can handle them. If you jump to 0:44 there is a brief section where Derek Roddy plays super fast 16th notes on the kick pad and they are audible well enough. As for the pedal, the Strike’s kick pad is large enough to accomodate any conventional double bass pedal. The ones I’ve tested with it are listed here. Once the initial setup is complete, what are the breakdown and setup times for this kit. Was wondering if it is a good option for live performance. Thanks for your question! I guess my setup time for the Strike Pro is about 15 minutes – with the breakdown being somewhat quicker, about 10 mins I guess. Since, the Strike is 1 tom and 2 cymbals smaller than the Pro, this would shave about 3 mins off of those times. So in my opinion the setup and breakdown times work for live performances without problem. And my experience is that people are very impressed with the appearance of the Strike Pro. Hi Yannick…..great article and comments. Looks like you’ve been playing the Strike Pro for over a year now and I’m wondering how it’s holding up. Have the firmware updates resolved all of the problems that initially plagued it? I’ve been waiting for a kit like this for quite a long time…..couldn’t bring myself to spend $2,500 for a TD25KV with 8″ pads, so I’m quite anxious to get playing on it. I’m just hoping that Alesis got it right for the long haul. Thanks for your question. I actually sold the Strike about 2 months ago – not because I was dissatisfied, but because I try to change kits regularly so I get an impression of as many as possible over a longer time frame (instead of testing them only once or twice). While I had the Strike Pro it held up without flaw. I do know there are people out there having the HiHat issue, but mine never caused any problems at all. Then again, a drummer I know had it but was able to resolve it by using a different HiHat controller. So I still think the Strike is a great kit, but don’t want to hide that some people still do seem to face issues.